Way back in mid-1990 when the IHSA finally expanded from coast to coast Colorado State University began to dominate the then-brand-new Zone 7, Region 1. The Rams proceeded to win 15 consecutive hunter seat region titles. However following the 2004-05 season Colorado State's equestrian team ceased to be, that is until it was re-born during the 2015-16 season. In 2017-18 the Rams won out in Zone 8, Region 5 and sent a full English team to Zones. Once at Zones Colorado State placed first or second in six of the eight team classes to secure second place on April 7th and a trip to Nationals with a full team for the first time since 2005. 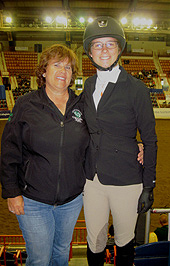 Pictured here are Rams head coach Kathy Montgomery (on left) and Lauren Walley inside the large arena at the Pennsylvania Farm Show Complex in Harrisburg, Pennsylvania on May 3rd. From Bend, Oregon, Walley was fifth in individual novice flat in the sixth class held at 2018 IHSA Nationals and in the final class of the day earned the Rams their first team point at an IHSA Nationals event since 2005 with a sixth in team intermediate flat. 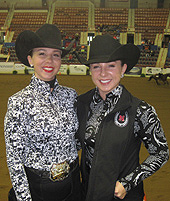 Pictured here are the Heusinger sisters, both of whom showed for the University of Nebraska at Lincoln at 2018 IHSA Nationals in Harrisburg last May. Conveniently from Lincoln, Nebraska, Anna (on left) was the first of the two to compete, placing fifth in team advanced western horsemanship on May 6th to conclude her four years with the Cornhuskers. Audrey showed in the very next class (team intermediate western horsemanship). A freshman at the time Audrey Heusinger was also fifth. Thus the Heusinger sisters accounted for four of Nebraska's ten points at the '18 Nationals show. 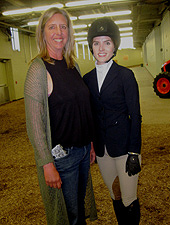 Colorado School of Mines head coach Jill Pelzel (on left) used to be able to say that the only rider from her team to qualify for IHSA Nationals was her daugher Allison (not pictured). Allison Pelzel (who rode at Nationals multiple times) graduated in 2017. 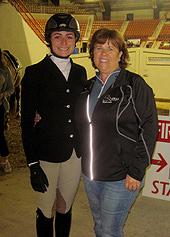 On April 7th Anna Green of CSOM (on right) won the individual novice over fences during Zone 8 Zones at the Stanford Red Barn Equestrian Center, thus becoming the first 'non-Pelzel' in program history to reach Nationals. From Frederick, Colorado, Melanie Lathrop of Colorado State University (on left, with coach Kathy Montgomery) was as busy as anyone entered at 2018 IHSA Nationals. Lathrop showed in five divisions over the course of three days. While her best ribbon was earned in the first class held at 2018 Nationals - 7th in individual open over fences - the final ribbon presented to Lathrop on May 5th was perhaps more significant. Lathrop was ninth in a field of 24 entered in the Cacchione Cup Competition. Lathrop played as big a part as anyone on the Rams in helping the team to their first Region Title since their re-birth prior to graduating in May. She is from Winside, Nebraska and over four years riding for the University of Nebraska at Lincoln she was on the winning side more than just about anyone else in her region. She is Selena Finn (pictured) and the recent graduate will be remembered most nationally for her first season. 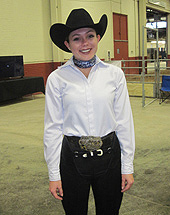 As a freshman in 2015 Finn won the individual AQHA High Point Open Rider Competition in her first of four appearances in the division at Nationals. Finn rode only in that one division at '15 Nationals in West Springfield, Massachusetts but rode multiple times at each IHSA Nationals held since. Among other accomplishments Finn won team open reining and placed fourth in team open horsemanship at '16 Nationals in Lexington, Kentucky when the Cornhuskers scored 17 points to finish only two points behind co-champions Berry and St. Andrews. Schools competing in 8, Region 5 during the 2018-2019 school year: Cloud Community College, Colby Community College, Colorado College, Colorado School of Mines, Colorado State University, Laramie County Community College, Southeast Community College, United States Air Force Academy, University of Colorado at Boulder, University of Colorado at Colorado Springs, University of Denver, University of Nebraska at Lincoln and University of Wyoming. Starting times listed are local time. Show Schedule subject to change.